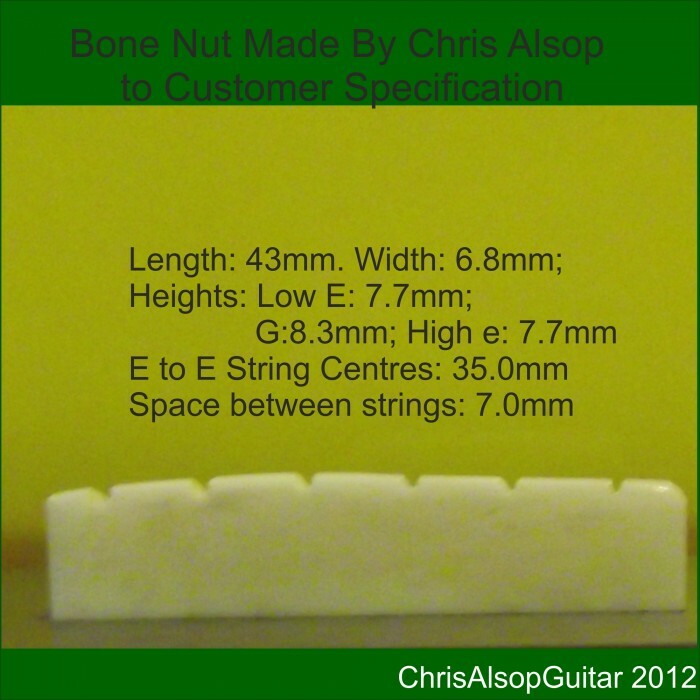 This nut is made from high density Ox bone and is for use on steel strung acoustic guitars. Any shape is possible for us to make we are only limited by the size of the raw material we use. 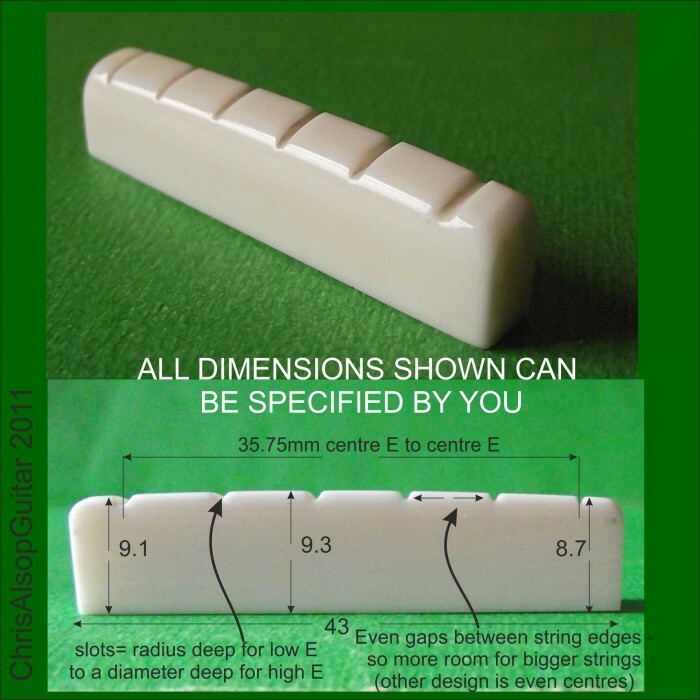 If the height is greater than 10mm , or the width greater then 8mm wide then the our "oversized nut" advert is the appropiate advert. (1). Accurately determine the position of one end of the vibrating length of the string. (2). Position the strings across the fretboard - usually evenly spaced (but we do non even spaced to make better use of the room available) with adequate room at the edges. (3). Position the strings over the fretboard so the action (string to fret distance) achieves playability and accurate note pitch (also called intonation). (4). Allow the strings to freely pass through the slots, without snagging, to achieve reliable string tuning and to allow string tension to even out quickly after a string bend. (5). Look good and be hard wearing. These items are hand made by myself in a workshop set up for the production of guitar parts and tooling. I use high precision measurement and a variety of shaping techniques commonly used in high precision engineering. I have a long history of making guitar parts encompassing design from first principles, performance analysis, acoustic analysis and manufacture quality control. I play guitar where - over many years - I have learnt to appreciate and understand the finer points of guitar parts design, performance and set-up from a players point of view. Its the same work for a left or right and the same price. I can also provide a graphic of the design to help discuss any aspects of the design with the buyer - I am always more than willing to discuss customers detailed requirements to make sure the end product works well. If there is no particular requirement then I will make the slots slightly wider than medium gauge strings and the string spacing will be proportional to the fretboard width with adequate clearance from high and low E to the edges. If you wish I can offer to cut the string slots specifically to match a particular string gauge. I can also make the string spacing a bit wider then normal. 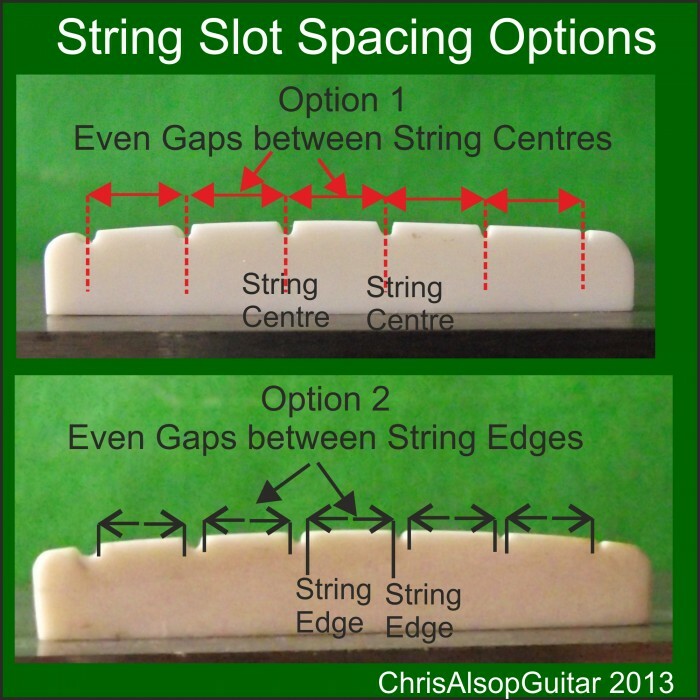 String Slot Depth --- Action at first fret -- Why we have to get it Right ! If the string slots are too deep then the strings will rattle on the first fret - if the string slots are too high then it becomes difficult to press the strings down into the first fret. Also, the change of string pitch due to the string stretching becomes audibly noticeable on first fret notes if the string slots are not deep enough. Our intonation studies and measurements confirm this. So how do we get the right nut shape? Practice and Theory ... a bit of both approach ! Nothing beats the actual performance of the real instrument. With the nut, I supply a step by step guide of how to get the right set up of the nut. Using the strings themselves as the guide it is possible to to trim the nut to achieve the correct action. I have used this method as a player for many years and it has always resulted in perfect playability. 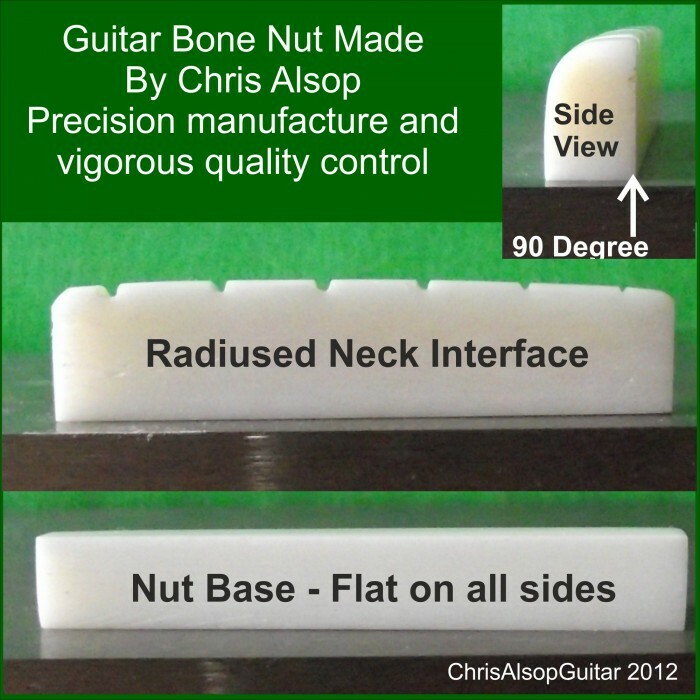 Shaping of the component may be necessary to get it to fit tightly into the nut slot and to achive the desired "action" - or string height above the fretboard. The material is easily worked with fine grit abrasive paper and finally polished with wire wool and/or scotch brite. Clear instructions for setting the nut action and supplied and advice is offered freely. The string slots are positioned but may need to be made deeper to achieve the desired action - a small needle file is adequate to do this operation - you just have to make sure you take a little off at a time and then put the string back in the slot - tighten it up - and then check it. A little at a time is a must for this adjustment! Its also important that the slots are smooth so the strings run through them easily when tuning. We include fitting instructions on how best to install a nut and guidance on setting the action correctly. We include plenty of abrasives and polishing material - the better the fit the better the tone ! 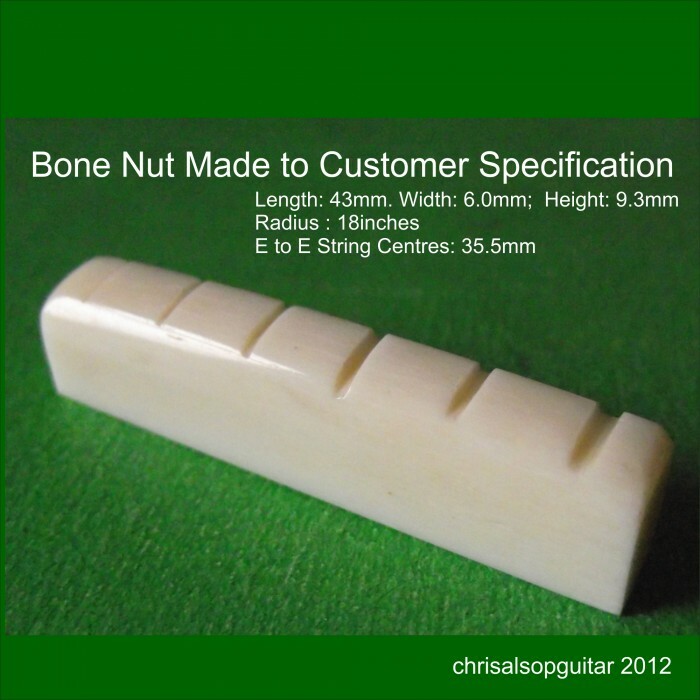 Cattle Bone Slotted Nut for 6 string Acoustic Guitar with modelling All our guitar nuts ar.. 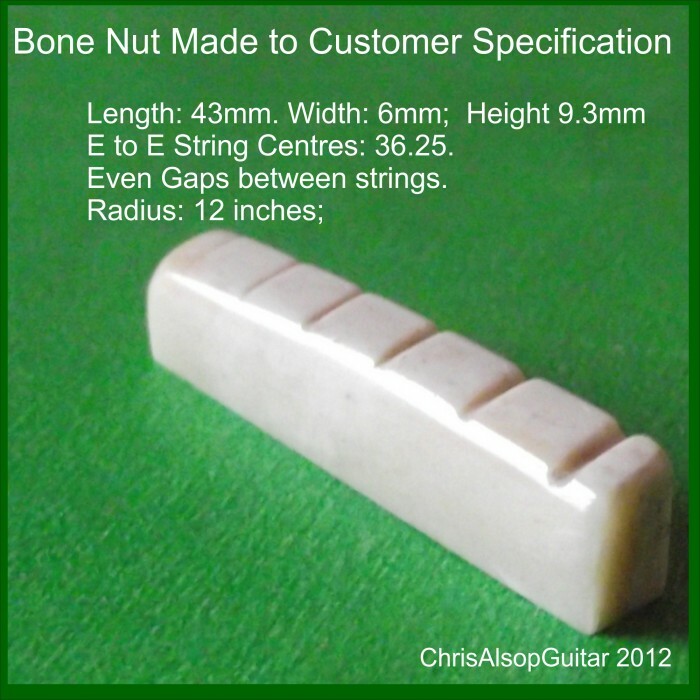 Extra Large Ox Bone Slotted Nut for 6 string Acoustic Guitar including Tailoring Mater..